I try to greet each new year by jumping into the ocean and catching a wave. If I'm good about it (and not on call) I try to meet the dawn of the new year in a special kind of hello and thank you. So... I guess it's a good time to highlight a bit of surf culture. Why surfing? Well, because it is an integral part of who I am, but also because it illustrates beautifully how different ideas of culture impact how we see life and death, and celebrate who we are and were. Culture is a funny word, and is probably overused. We tend to view it through the eyes of ethnicity, nationality, or faith, but we each exist in many types of communities each with their own cultures. As you think of your own life, you can probably identify which communities are the ones that are most important to you, which "culture" has the most meaning and helps you define who you are at your core. Isn't this where we find the stuff in the top three layers of Maslow's? Isn't that what gives us meaning and purpose? Isn't this some of what is lost when we find some our patients in the deepest throes of existential suffering? 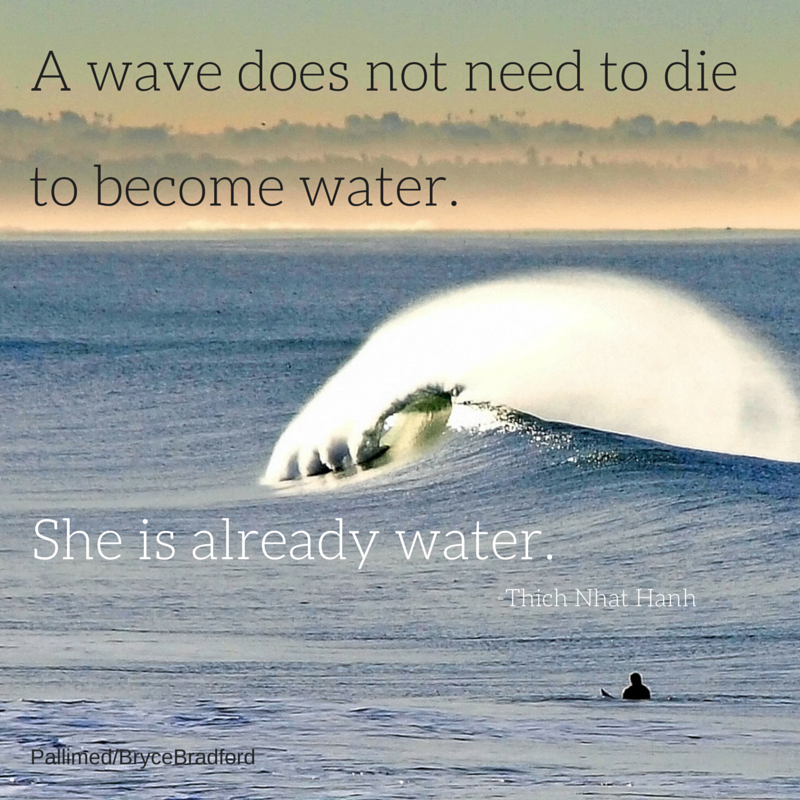 "A wave does not need to die to become water. She is already water." Surfers are a funny bunch. It includes people of all educational backgrounds and socioeconomic levels, young and old, male and female. We are linked by our fierce passion for the ocean, and we know we are a part of something mysterious, awesome, and greater than ourselves. You only have to sit atop your board at sunset with dolphins playing in front of you, or paddle like hell to get over the huge wave about to break on your head to know that truth deep in your core. If you practice medicine near a body of water with waves (this includes the Great Lakes too! ), you will probably have a surfer for a patient. Ask about hobbies in your social history. Know that one of their most profound connections is to that deep blue mystery. Rell Sunn, known as the Queen of Makaha, exemplified this when she continued to surf despite being hospitalized and getting chemotherapy for her breast cancer. When a respected members of our tribe dies, we mourn their loss and celebrate their life by having a paddle out. The Irish have wakes, people in New Orleans have jazz funerals and second line parades, surfers have paddle outs. The tradition is thought to have originated in Hawaii in the early 1900's and moved to the U.S. mainland and around the world since that time. 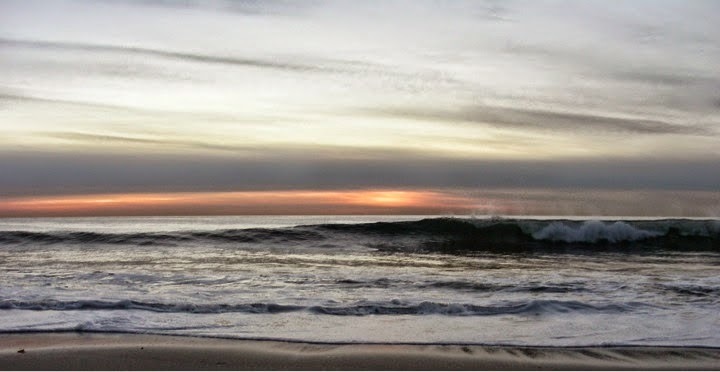 Paddle outs can be done as a memorial or a celebration of life, with less or more of the spiritual components. Most paddle outs are more humble affairs, but all include family, friends, and members of the local surfing community. There are pictures, food, flowers, not so different from other types of remembrance ceremonies. Some are big affairs as you can see in the videos from the paddle outs for pro-surfer Andy Irons in 2010, or Newport Beach lifeguard Ben Carlson who died in 2014 while in the line of duty. Some are done more than once, the most famous is done annually for the opening ceremony of the Eddie Aikau memorial surf competition held by Quiksilver. UCSB surf club hosted a paddle out for their classmates who were killed in 2014 in Isla Vista. Junior Seau, the NFL player, had a paddle out after his death in 2012. It happens more than you are aware of, but if you have a chance to be a part of one, go. It's a beautiful experience. In a more traditional version of a Hawaiian paddle out, a Hawaiian Kahuna or Ku'puna stands on the beach in the water with the family and calls in the person's spirit with prayer, and an Alaka'i blows a conch shell which has been blessed in the ocean. Ocean water is brought in a bowl and the family, close friends, and the ashes are blessed by the Kahuna or Ku'puna with wet tea leaves. As the tea leaves touch those close to the deceased, it is a way of passing on the person's mana, or spiritual power. The family publicly thanks the gathered community, prayers are said, and the conch shell is blown again calling out to the spirits. The ashes are wrapped in the tea leaves with the sinking stone, and the people who are going to be paddling out stand on the beach facing the surf and hit their surfboards to make noise as the Kahuna or Ku'puna chants a warrior chant. Next, everyone paddles out on their surfboards (often family is in a boat), and form a circle with the family in the center. People hold hands, say prayers, and tell stories about the person who has died. The ashes are placed into the water, the flowers and leis are thrown into the center of the circle, and people cheer and splash the water to celebrate the person who has died. Finally, people catch a wave in to shore carried along, surfing, with that person's spirit. The first paddle out I went to, was for a long-time local surfer whose last name I didn't know until he died of a heart attack on the beach. He was a kind man, who gave me a few gruff pointers when I first started surfing, and yelled, "Paddle!" at me when the wave came. You have to understand that most people either avoid you or grumble at you when you are first starting to surf, so his help was very much appreciated. It was moving for me to witness the powerful ceremony, to be a part of celebrating him and remembering his life. I learned he was a lifeguard who taught others how to save lives, and it seemed like everyone I'd ever seen in the ocean was in that floating circle. I cheered and splashed, and threw my flowers into the water. As I caught a wave in, I said a little prayer of thanks for Davey's life and for the community that gathered to celebrate it that day, and I felt gratitude for his presence. Paddle outs are a part of who we are as surfers, a part of our culture. I know there are lots of communities of all types that celebrate people's lives and deaths in unique and interesting, yet sacred ways. I hope to continue to learn from my colleagues and patients these cherished bits of culture that make us all part of a fascinating human story. Hopefully we can get a few more "culture" posts highlighting some of these as we go along. If there are particular ones that pique your interest, let us know and we'll try to shed some light on them. Wishing you all a wonderful next chapter in this adventure called life in 2015! Special thanks to Kai Buanoi and Unko Mo for helping me with this post. 2015 Pallimed and GeriPal Party - Philadelphia!